Staining your fence can be challenging, but it will make it look beautiful and protect it from the elements. You are interested in taking your beautiful wood fence to the next level, but you’ve heard that staining can be draining, paining, and full of complaining. Luckily, we have decades of experience in installing and staining wood fences! Here are some of our favorite tips to help ensure your fence staining experience is seamless and headache-free. 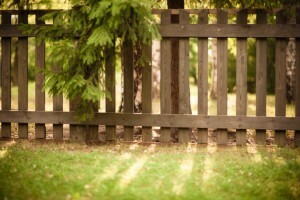 Is your fence brand new? Wait at least three weeks to begin the staining process. That brief waiting period allows your wood fence to acclimate to the new environment and open its pores. Waiting ensures that the stain will apply evenly and beautifully. If you have a new fence or an old fence it’s important to choose the right day for staining. Apply the stain in the morning or late afternoon on a cloudy but not raining day. Choose a time where the fence has been dry for over 24 hours and there isn’t any precipitation in the forecast for the next 24-48 hours. The highest quality stain will not look very good if applied with the lowest quality tools, so make sure that you pick the right tools for the job. Choose high-quality brushes, rollers, or pads that suit your needs. If you want to use a brush, choose one made for staining that is at least 4-5 inches wide. If you want to use a pad, use one with a fluffy nap to ensure good coverage. If you are using a roller, just about any good quality paint roller will work. If you are staining an older fence, make sure that you remove any mold, mildew, or dirt left behind on the surface. All of those things will prevent the wood from properly absorbing the stain. Clean the fence at least a couple days before you start staining. Wear the right protective gear and scrub your fence with a solution made from 1 part bleach and 3 parts water. This entry was posted on Friday, February 24th, 2017 at 8:31 pm. Both comments and pings are currently closed.